The title of this painting “Choice” refers to the saying that “the most spiritual thing we do is to choose”. 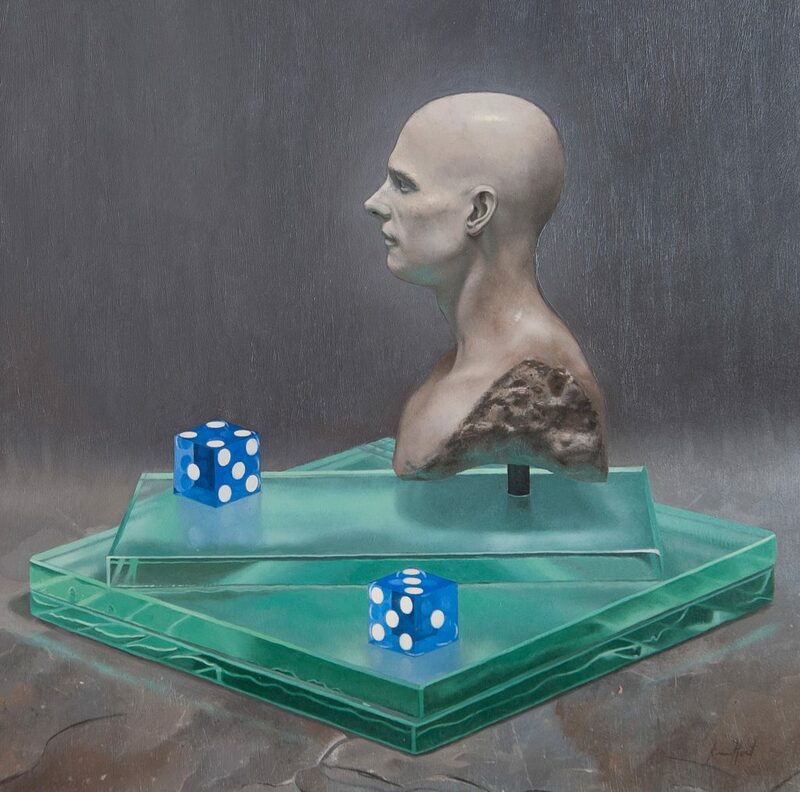 The sculpture in the painting, and the viewer, are presented with two paths to consider as well as two ways to view the roll of the dice. The number 7 is facing up, which, in the dice game of Craps, can be a winning or a losing number. In the painting it is left unknown whether it is a good or bad roll, so the viewer is brought to a decision point. Moving deeper we see three instances of the number 7 (7 objects, 7 by adding the top numbers on both dice and 7 by adding two and subtracting one number of the front die 5+3-1=7). This is significant in many ways but the viewer is invited to draw their own hypothesis of the true meaning in relation to the rest of the painting. 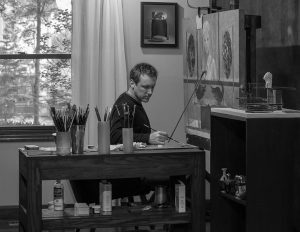 A Columbus native and emerging talent of contemporary realist painting, Brian T. Port combines traditional oil painting techniques with rich symbolism to create work both indelible and beautiful. Judiciously choosing still life items such as figurative sculptures, glass, and found objects, Port creates thought-provoking compositions that compel the viewer to investigate the relationship between the objects. Port’s current work explores ideas of redemption, perfection of design within the imperfect, decadence and the consequences thereof. He builds up thin layers of paint over time, (often exceeding 150 hours), first using direct then indirect methods to create depth and luminescence.Â Port holds a BFA from the Columbus College of Art and Design.Â His work has been shown multiple times at the Fort Wayne Museum of Art, Evansville Museum of Art, and the Butler Institute of American Art. Port is also a recipient of the Museum Guild Purchase Award from the Evansville Museum of Art, adding his work to their permanent collection.Â Most recently Port was the recipient of the 2014 Visual Arts Fellowship from The Greater Columbus Arts Council & The Columbus Museum of Art and currently has eight paintings on display at the Columbus Museum through summer of 2015.